What are email autoresponders? – An email autoresponder or automatic email response is an email that is sent automatically in response to some form of trigger. They were used mainly for requesting information. 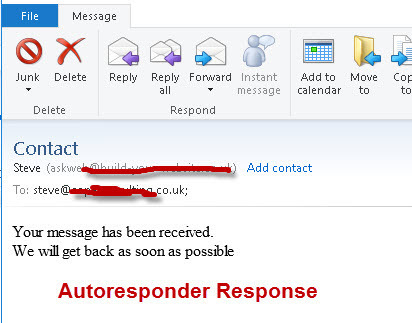 An email response containing the information is sent to the sender email address- The auto response. Because an autoresponder should normally be available 24/7 they are usually implemented on a server. Email providers used by small business (e.g. 1and1 email) will often provide simple autoresponders that can be configured to send a response to all email regardless of time. This type of autoresponder is often used for sending general enquiry information. On 1and 1 login to you control panel and go the the Mail section and click the Mail icon/link. 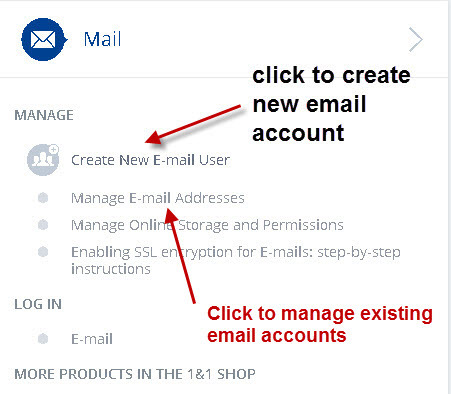 If you already have an existing email account you want to use click the manage email addresses link. Note: Common names for autoresponder email addresses are sales,orders etc. Now scroll to the bottom and you should see an autoresponder link in the section other settings. It should be disabled. Now click on edit and then click in the enabled box and an message box appears. Enter your autoresponder message in this message box and OK when done. 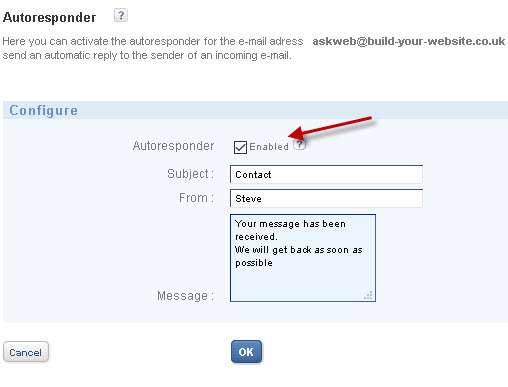 If you now compose and send an email to that address you should see the auto reponse as shown in the example below. Because the autoreponders provided by most web hosting and email hosting providers are very basic there are many commercial autoreponder services available. Auto responders are also provided by sales systems and CRM systems. In addition, over the years auto responder systems have evolved to include the ability not only to respond to messages but to initiate them i.e. they have developed many of the functions of mailing lists and vice versa. Therefore the distinction between the two is very blurred such that most autoresponder software/services have the ability to manage mailing lists and vice versa. Autoresponder Service– Here the autoresponder software resides on another server and you simply subscribe to the service. This is by far the most common method used, and although it generally works out more expensive it is far easier to set up and more flexible. This is the recommend option for small business owners. Autoreponders are in common use on the Internet and are used to automatically provide customers with up to date information e.g. order tracking. They have merged with mailing list software and services and commercial autoreponders provide mailing list functions. Simple email autoreponders are provided by most web hosting providers with their email packages.